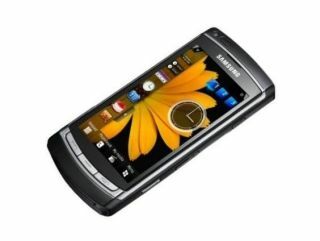 Samsung has launched its i8910 HD phone, with Orange selling the impressive handset – formerly known as Omnia HD - in the UK. The Samsung i8910 HD features a capacitive 3.7 in AMOLED 360x640 screen an impressive 8MP camera with autofocus, an accompanying LED flash and a truck load of trickery that you'd normally find in your digital camera, including Smile Shot, Blink Shot, Panorama and Face Detection. Audio playback includes AAC, AAC+, MP3, eAAC, WMA and Real Audio playback and can be over dual stereo speakers with DNSe 2.0. Samsung's i8910 HD also features WiFi, HSPUA, aGPS, Bluetooth 2.0 with A2DP, has 8GB of flash memory and is expandable to a total of 40GB through a 32GB compatible microSD slot. Oh, and don't forget the push email (through MS exchange) and the 1500mAh battery. You can get the Samsung i8910 HD from Orange for just shy of £100 with an 18 month £35pm contract, but expect to pay around double that for smaller plans.